Have you ever heard of coconut flour? I have been working with it for a couple of years now since it was introduced into the market, and I have learned a lot about it! Tropical Traditions’ coconut flour, (which is the only coconut flour I use) is the fiber from the coconut meat after almost all the oil has been extracted to make Coconut Oil. It is certified organic, unsweetened, and contains no sulfites. It’s gluten free, making it a suitable wheat flour substitute for those with gluten and wheat allergies. It also high in protein and fiber, containing more fiber then gluten based grains. The coconut flour tastes very coconutty, and has a mildly pleasant sweet taste.For baking or cooking, you can substitute anywhere from 10 – 30% of regular flour for coconut flour to add extra fiber. Some recipes however, can be made with 100% coconut flour and be totally gluten free (and foolproof, no one would ever know!). The easiest ones to do this with are muffins, bars, pancakes, cakes and quick breads. (See recipe below). Since coconut flour has no gluten, plenty of eggs must be used to make up for it. On average, for every 1 cup of coconut flour, 4-5 eggs must be used. To help with binding, sticky sweeteners can also be used, like brown rice syrup, maple syrup, etc. 1 tablespoon of ground flax seeds soaked in 3 tablespoons of water can also replace 1 egg in recipes, and this can be very helpful in coconut flour recipes. Keep in mind too that coconut flour is a very “thirsty” flour, and soaks up amazing amounts of liquid. So it’s very likely that you’ll have to increase the liquid amount in your recipe depending on what you are making. A lot of recipes containing wheat flour can be converted to 100% coconut flour, but this will take time and patience. Coconut flour behaves differently from recipe to recipe, so a lot of tweaking and adjusting will have to be done. 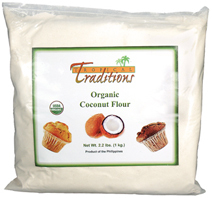 All my coconut flour recipes have been made with Tropical Traditions’ coconut flour; therefore I cannot assure you that they will work with different coconut flours, which might be higher in fiber and lower in protein content. Ways to use coconut flour are endless. You can use them to make a roux for gravy, add a tablespoon or so to smoothies and drinks for extra fiber, sprinkle on different dishes for a garnish and a coconut taste…use your imagination! Be creative! And now a recipe using all coconut flour! This is a recipe I developed myself, and every time I’ve served it it’s been a hit. 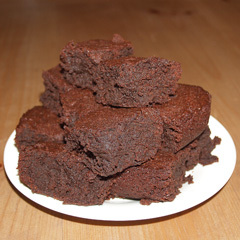 The brownies are dense and fudgy; packed full of dark chocolate goodness. No one will ever know they’re gluten free, unless you decide to tell them. 😀 If you love dark chocolate, you’ll love these. Preheat oven to 350 degrees F. Grease and dust an 11×8 pan with coconut oil and cocoa powder. Place butter, sugar, chocolate, and brown rice syrup in a medium sized pot and melt on low heat, stirring until everything is well blended (mixture does not have to be smooth). Sift in the cocoa powder. Remove from heat and set aside to cool. Beat the eggs and vanilla extract together with an electric mixer until frothy. Then on low speed, mix in cooled chocolate mixture. Alternatively add in the flour, baking powder and heavy cream, beating mixture after each addition. Pour mixture into the prepared pan and bake the brownies in the preheated oven for 30 minutes or until the top of the brownies is crisp and slightly cracked. (The inside of the brownies will be dense and soft to the touch.) Cool the brownies in the pan on a wire rack until cool. Cut into bars and serve. Frost with chocolate or vanilla frosting if desired. Enjoy!! There you go! If you have any questions please feel free to ask me in a comment. Mix all in order given in large blender. Blend on high speed until smooth. Use organic for everything if possible. Enjoy! 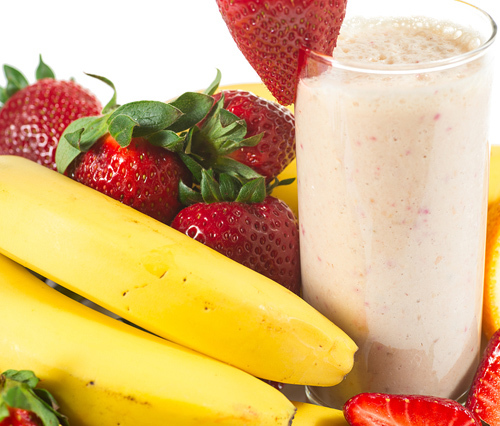 Place all ingredients into blender and blend until smooth. I start my day out with this every day. In small bowl combine virgin coconut oil, organic coconut flour, organic honey and mashed banana. Mix well, incorporating oil thoroughly. 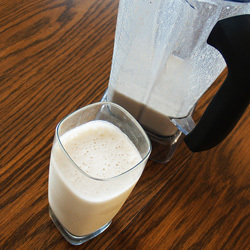 Pour into blender and add all other ingredients, except ice cubes. Puree on high until well blended, and then blend for another 1 minute. If mixture is too thick for your taste, you may add some water, or add the ice and blend on high until ice is completely crushed. 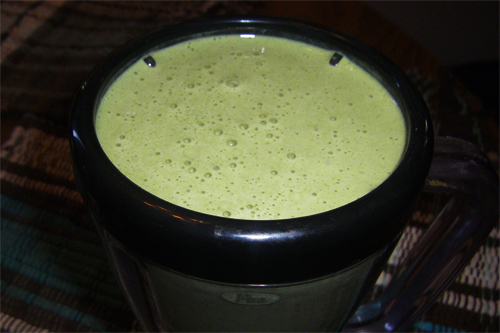 This makes a nice afternoon snack on a hot day, or a good morning drink at breakfast time.